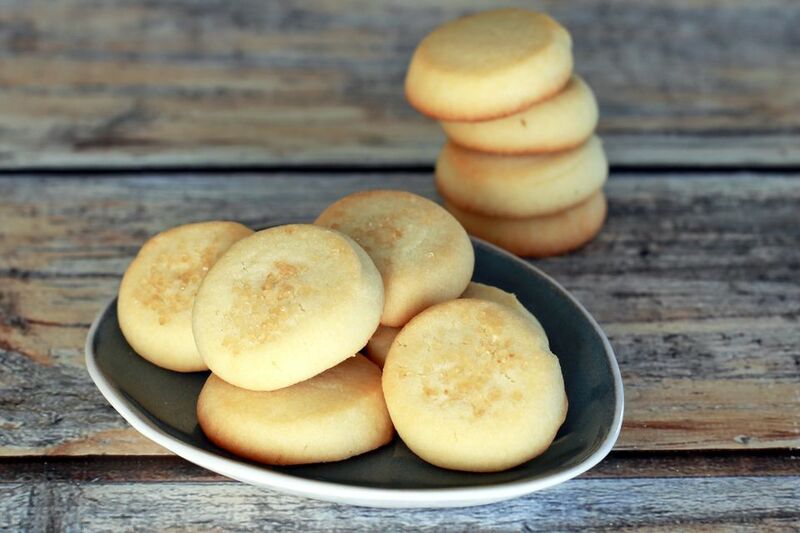 These butter cookies are flavored with almond extract and vanilla extract and sprinkled with a little sugar. Shape them into cylinders or logs or other shapes before baking. These little cookies literally melt in your mouth, and the vanilla and almond extracts give them fabulous flavor. Cream butter until light and fluffy; beat in salt, almond extract, and vanilla extract. Gradually blend in confectioners' sugar then sifted flour. Chill for about 1 hour, or until dough is easier to handle. Shape dough into rolls about 3/4-inch in diameter, then cut into 3/4-inch lengths. Place, ends up, on ungreased baking sheets; press lightly with the bottom of a glass covered with a damp cloth. If desired, sprinkle cookies with colored sugar or granulated sugar. Bake at 400F for about 10 minutes.